Online publishers used to search for how to get the most traffic to your website? Should you republish, change the date, or update your blog post to build website traffic? How to get more traffic from an outdated post by republishing? Where can I post my blog to get more traffic? How to bring old blog posts back to life? Let's check out how to rewrite and republish old content & optimize the content. This is an excellent approach to rewriting & reviving your old posts, as a result, it will make your all blog posts SEO friendly & will help to keep your blog/domain more secured from the Google Panda update penalty. Imagine if you get at least 20 new visitors per day for your updated posts - that will make lots of effect on your growth and thus on getting higher PageRank & Domain Authority. Instead of buying web traffic, and to get better Google rank I recommending to update your old posts. Don't delete your blog post, rather recycle it with new fresh content & republish it to get a lot of traffic to website. Most of the users are talking about how to repost on Facebook or medium but if you have CMS then there is WordPress plugin to post to social media sites. New WordPress plugin makes republishing easier and able to drive traffic. But how to auto post to social media sites is another thing and making the older post again updated & fresh before google remove outdated content from the search engine is the prime thing we are going to check today. Learn how to edit, repurpose & republish older pages and how to generate new organic traffic from updating old posts. Recently I have just updated my one of the old post that offers Online Free Meta Tag Generator for all the bloggers and website developers. Updating older posts kills two birds with one stone; one is being outdated information and another is the lack of optimized SEO comparing with new working keywords. 1. Recover reputation & improve traffic. As long as you are busy writing new posts in your niche for your active followers, along with you need to keep in mind about the SEO optimization when editing and republishing your old posts. Google displays the new & fresh content in its SERPs that helps visitors to determine the current information derived from the post. Sometimes if you monitor your website, in old posts the information can simply become outdated or even includes broken links that no longer working. So updating those links along with fresh content makes your post more valuable. And that will also cause a great impact on your reputation. 2. 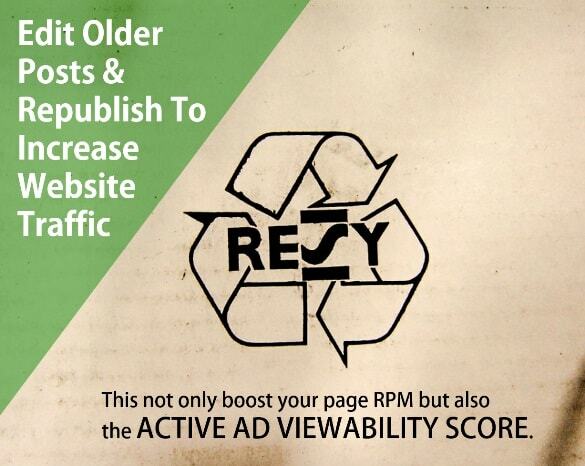 Increase your active ad viewability score. Keep in mind that, like everyone, Google also loves updated information and the fresh content derived from all of your sites. Your older & outdated posts or information in this highly changing world of technology causes your visitor to jump from your site to another, this will cause higher bounce rate and ultimately low ranking. Post with latest & updated info causes a better chance of picking up natural search engine traffic and it will make your post for getting high ranking in SERP. This not only boosts your page RPM but also the percentage of impressions that were viewable out of all measurable impressions. As because; Google algorithm analyze your every user engagement including his average time on that page & bounce rate and other factors to determine page ranking; once you update old blog post, with the newest info you will notice improved user activities on those pages in analytics that will increase the value of your post. 3. Properly update, recycle, republish old posts for traffic & exposure. Although this is one of the working strategy for better blogging; one has asked about the problem with the approach in republishing the posts that will be creating duplicate content might make your blog a victim of Google Algorithm Update. Here the term: REPUBLISH means to edit with new fresh content, change date-stamp and click to publish. That's it. You just need to edit your content with the latest facts and figures then simply change the time-stamp to latest one - the result of this your post will show on the homepage at the top position. Just ignore the dates of comments posted on that page. If you modify the older blog posts, Google will take the updated date and display it in the SERPs. You just need to optimize the posts for SEO without compromising the quality of the content, title or permanent link to the post that will expose your articles to more readers. It’s very important that you need NOT modify the permanent link – URL of your post in any condition. Keep it as it was there previously to keep all the link build equally and working unbrokenly. Suggesting to edit old posts when you are running out of new ideas to offer new unique and fresh for all your visitors. Just add some life to your existing content of every older post resultantly that will make your current life affluent and motivates you to write more posts.